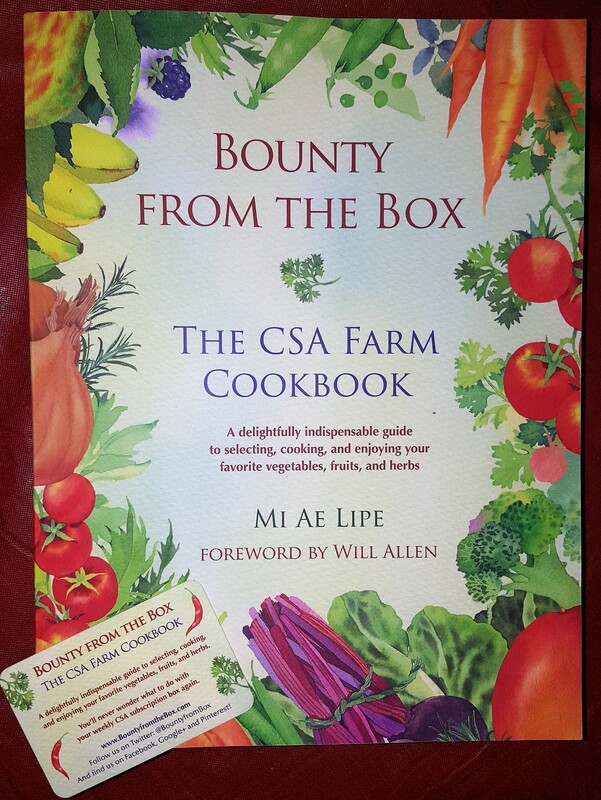 Just received a physical copy of the book “Bounty from the Box: The CSA Farm Cookbook” by Mi Ae Lipe. In December I purchased a digital copy of the book with the hope that it would help us provide recipes to our CSA members. (The digital copy is only available to CSA farmers at this time with specific permissions from the author.) Joining a CSA can be somewhat stressful. Every week you are going to get a whole bunch of vegetables and it is likely that you will not have any idea what to do with some of them. Last year we provided eggplant, kale, cucamelons, tatumi squash and a full 20 weeks of Swiss chard to our members. We tried to give recipes, cooking and preserving tips especially when we were providing something new or even yet again. I had not really taken the time to look at the cookbook but did including a link to Bounty from the Box on our website and the announcement about 2017 membership. Friday I received a print copy in the mail. I was astounded by the size of the book. It is the size of a 500 sheet ream of printer paper. In actuality it is almost 700 pages long but it does really look like a ream of paper. The book is organized around the seasons beginning with spring CSA offerings and ending with winter. Each entry includes a bit of history of the vegetable or fruit, nutrition facts, cleaning tips, several basic ways of cooking it (including microwaving) and information on preservation. The book is easy to scan through and entertaining to read. I was truly impressed by the size of the book and the number of recipes and vegetables included. Later, when we have fresh veggies from the garden and more time to play with them and I will post more about the recipes. Looking through them though, they appear well balanced for a variety of eating styles and requirements. If you eat meat, are vegan, need gluten free or other specialized diets you should be able to find recipes in this book that will help you eat the way you want or need to and use your CSA share in interesting ways. We will be trying some of the recipes in the near future with food that we preserved last season. I may even contact some of last season’s members to find out what they have preserved and share some of the recipes from the digital version early. I know that some members still have food in the freezer. They have told me about meals they have made this winter with our produce. I find it especially gratifying to talk to a member in December or January that is pulling from their freezer a container of vegetables we grew and enjoying a bit of summer during the winter doldrums. You can get your own copy of Bounty from the Box at www.bountyfromthebox.com. Follow them on Twitter @BountyfromBox and on Facebook @BountyfromtheBox.